Hematopoietic stem cells (HSC) are tissue-specific adult stem cells capable of differentiating into all blood cell types to ensure homeostasis of blood throughout life. Research on murine HSCs dates back to late the 1940s early 1950s, when it was discovered that sub-lethally irradiated mice could be rescued from hematopoietic failure by injecting cells from blood-forming organs, such as the bone marrow. This finding lead to the idea that cells in bone marrow with repopulation capacity could be further characterized and quantified in transplantation models. In early experiments, decreasing numbers of bone marrow cells were injected into recipient mice to determine the lowest cell number need to fully reconstitute hematopoiesis. Further experiments transplanting sub-radioprotective doses of bone marrow cells into mice showed that these mice developed colonies of hematopoietic cells in their spleens. The number of colonies found revealed a clear correlation to the amount of bone marrow cells originally injected. The advent of fluorescence-activated cell sorting technology and monoclonal antibodies then finally lead to the identification of surface markers which are used to identify mouse hematopoietic stem cells. The main source to isolate mouse HSCs is bone marrow, where they represent approx. 0.01% of the total cells. Mouse HSCs are characterized and/or isolated using several surface markers. Firstly, mouse HSCs lack the expression of lineage-specific markers (ie., are lin–), and are positive for c-kit (CD117) and Sca-1. More recently, the HSC population was further narrowed down by including CD150 and CD48, resulting in the marker profile Lin–c-Kit+Sca-1+CD48–CD150+. Murine HSCs are usually isolated from bone marrow prepared from the tibia of the hind leg. Miltenyi Biotec has developed products to pre-enrich lineage-negative cells containing HSCs from mouse bone marrow cells using the MACS® Cell Separation Technology. The Lineage Cell Depletion Kit, mouse and the Direct Lineage Depletion Kit, mouse enable fast pre-enrichment of mouse HSCs from bone marrow by depleting cells expressing lineage markers. Designed to magnetically label mature cells (T cells, B cells, NK cells, dendritic cells, monocytes, granulocytes, and erythroid cells) and their differentiation-committed precursors, the kits generate an enriched population of untouched HSC and progenitor cells. The Direct Lineage Cell Depletion Kit, mouse is especially formulated for a quick one-step pre-enrichment process, whereas the Lineage Cell Depletion Kit, mouse enables the most stringent depletion of Lin+ cells from bone marrow. Quick, one-step separation of lineage-negative cells. Untouched lineage-negative cells were isolated from a single-cell suspension of mouse bone marrow using the Direct Lineage Cell Depletion Kit, mouse and a MidiMACS™ Separator with an LS Column. Cells were fluorescently stained with Lineage Cell Detection Cocktail-Biotin and Anti-Biotin-APC and analyzed by flow cytometry using the MACSQuant® Analyzer. To evaluate the LSK (Lin–Sca-1+c-kit+) fraction, cells were further stained with CD117-PE (c-kit) and Anti-Sca-1-FITC. Cell debris and dead cells were excluded from the analysis based on scatter signals and propidium iodide fluorescence. HSCs can be further separated from lineage negative (Lin–) cells using specific MACS MicroBeads, like the CD117 MicroBeads, mouse or the Anti-Sca-1 MicroBead Kit. CD117 MicroBeads isolate murine progenitor cells. CD117 (also known as c-kit, steel factor receptor, or stem cell factor receptor) encodes a 145 kD cell surface glycoprotein belonging to the class III receptor tyrosine kinase family. It is expressed on the majority of hematopoietic progenitor cells, including multipotent hematopoietic stem cells and committed myeloid, erythroid, and lymphoid precursor cells. In addition to their hematopoietic cell differentiation potential, CD117+ stem cells from murine bone marrow are reportedly capable of differentiating into smooth muscle cells, myocytes, and endothelial cells in vivo. CD117 is also expressed on a few mature hematopoietic cells, like mast cells. Enriched murine hematopoietic progenitor cells. 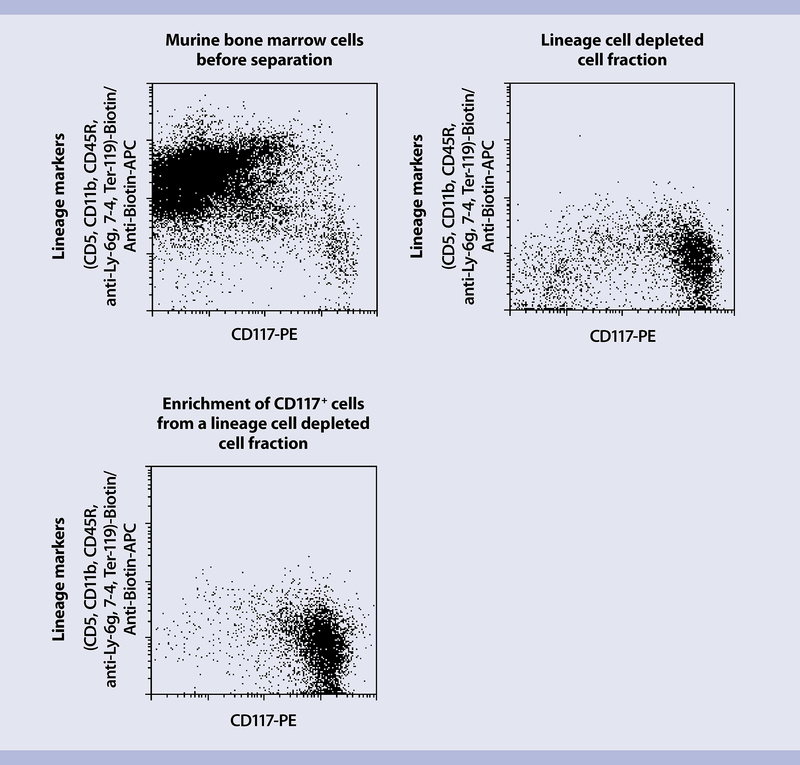 Lineage–CD117+ cells were isolated from mouse bone marrow using the Lineage Cell Depletion Kit, CD117 MicroBeads, an LS Column, and a MidiMACS Separator. The cells were fluorescently stained with CD117-PE and Anti-Biotin-APC against the panel of biotinylated antibodies used for the Lineage Cell Depletion Kit, mouse. Cell debris and dead cells were excluded from the analysis based on scatter signals and propidium iodide fluorescence. Enriched murine hematopoietic progenitor cells. Lineage–CD117+ cells were isolated from mouse bone marrow using the Lineage Cell Depletion Kit, CD117 MicroBeads, an LS Column, and a MidiMACS Separator. The cells were fluorescently stained with CD117-PE and Anti-Biotin-APC against the panel of biotinylated antibodies used for the Lineage Cell Depletion Kit, mouse. Cell debris and dead cells were excluded from the analysis based on scatter signals and propidium iodide fluorescence. Biotin-conjugated monoclonal antibodies against CD5, CD11b, CD45R (B220), Anti-7-4, Anti-Gr-1 (Ly-6G/C), and Anti-Ter-119. Hematopoietic stem cells are routinely analyzed by flow cytometry based on various extracellular and intracellular markers. The Lineage Cell Detection Cocktail-Biotin, mouse simplifies the flow cytometry analysis of cells before and after cell separation using MACS Technology. All antibodies are optimally titrated to be simply added to an aliquot of a cell fraction before analysis. Miltenyi Biotec also offers a wide range of unique and standard monoclonal antibodies for research of HSCs and progenitor cells, including CD117, Anti-SCA-1, CD150, and CD48. Fluorochrome-conjugated MACS Antibodies are perfectly suited for the identification, enumeration, and characterization of HSCs, which can be combined into panels tailored to specific research needs. An online tool to quickly construct the right multicolor flow cytometry panel for each research project can be access via the Related Resources panel to the right. For details about Miltenyi Biotec antibodies and dyes for cell analysis, see chapter Cell Analysis – Reagents. Isolated mouse HSCs can be further expanded in cell culture with HSC-relevant growth factors to obtain higher cell numbers or to elucidate mechanisms and signaling pathways driving self-renewal or differentiation. Early acting cytokines – mouse stem cell factor (SCF), Flt3-Ligand, and Interleukin-6 (IL-6) – expand primitive HSCs, although current HSC culture systems allow only limited expansion and maintenance of primitive HSCs that can engraft and completely restore the entire blood system. Viral transduction is a fast and efficient method to study gene function, modulate gene expression, or as potential vector for gene correction in gene therapies. The transduction of HSCs is especially interesting because of their potential to permanently cure hematopoietic defects. The modification of HSCs with retroviral vectors often requires the presence of a transduction-enhancing reagent. Polycationic reagents induce aggregation of vector particles and facilitate binding to target cells via electrostatic interactions. Bridging molecules, such as recombinant fibronectin, interact with both vector particle and cell membrane. Transduction performance can be enhanced with centrifugation.